With an area of about 120,000 square meters, Qingyang Temple (青羊宫) was originally built in the Zhou Dynasty ( 1046 - 256 BCE). It was destroyed in the war in the Tang Dynasty (618 -907). The existing temple was rebuilt from 1667 to 1671. The Eight Diagrams Pavilion is the best-preserved and the most gorgeous building in the temple. Situated in the southwest of Chengdu, Qing Yang Temple is acclaimed as “the No. 1 Taoist Temple in West Sichuan”, with Wuhouci Temple to the south, Du Fu Cottage to the west and Erxian Taoist Temple. Qing Yang Temple offers the mountain gate , the Sanqing Hall(三清殿), and the Hall for Emperor of Tang(唐王殿) and the Hunyuan Hall(混元殿). The gate was originally built in the Ming Dynasty (1368 - 1644), with the statue of a white tiger on the right and the statue of Tudigong and the statue of the Azure Dragon standing on the left. Sanqing Hall is the main hall. It was originally built in the Tang Dynasty and rebuilt in 1669. The supreme gods in the Taoism - Yuqing Yuan Shi Tianzun(玉清元始天尊), Shangqing Lingbao Tianzun(上清灵宝天尊) and Taiqing Moral Tianzun(太清道德天尊) are worshiped in the hall. Statues of two bronze green sheep stands in front of the temple. The green sheep feature the characteristics of the zodiac, including the mouse ear, cow body, tiger claw, rabbit back, dragon horn, snake tail, horse mouth, sheep whiskers, monkey head, chicken eyes, dog belly, pig and buttocks. Standing between Sanqing Hall and the Hunyuan Hall, the round Eight Diagrams Pavilion symbolizes the theory that the heaven was round and the ground was square in the ancient times. Statues of lions, elephants, tigers and leopards stands on the tip of the overhanging eaves of the pavilion. Carved in pearwood in 1906, the Daozang Jiyao (道藏辑要) is composed of more than 13,000 pieces of pearwood with characters on both sides. It is the most complete and well-preserved Taoist inscription in the world. 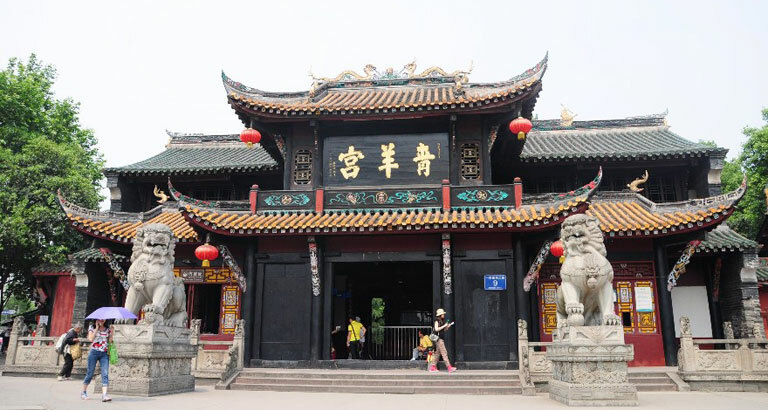 Compared to Chengdu Panda Research Base, there are fewer and fewer visitors to Qing Yang Temple. Therefore, you can visit it at any time during its opening hours. The best months to visit it is from March to May and from September to November as these months are not so cold or so hot. Qing Yang Temple is located in downtown Chengdu. Therefore, there are several options. Take Bus 5, Bus 11, Bus 17, Bus 19, Bus 25, Bus 27, Bus 34, Bus 35, Bus 42, Bus 47, Bus 58, Bus 59, Bus 63, Bus 82, Bus 84, Bus 109 and Bus 302 to the temple. Please don’t talk loudly in the temple. Please don’t wear shorts, short skirts and mini-dress in the temple. Interested in visiting Qingyang Temple on a Tour? Wendy Wei Tours offers a variety of different packaged tours as well as custom tours including Qingyang Temple, among other attractions and destinations. To find out more, please visit our Tours page or Contact Us directly to find out more.